Okta Software (NASDAQ:OKTA) isn’t a household name like Alphabet (NASDAQ:GOOGL, NASDAQ:GOOG) or Microsoft (NASDAQ:MSFT). However, that doesn’t mean investors should ignore Okta stock, which is a growth monster right now. In late-March, we highlighted Okta as a top mid-cap growth stock to buy. Okta was listed alongside six other top picks that caught our eye as shares were racing higher. We said investors who have missed the boat thus far (although they shouldn’t have based on our call that its earnings selloff was premature and an over-reaction) could hope for a buyable pullback. So far that hasn’t materialized, with shares up almost 20% since that article was published. What now? Should You Chase Okta Stock Now? Generally speaking, I don’t like to chase stocks. Okta may be a great company but that doesn’t mean I want to pile into the name after we’ve seen a near-24% rally in the S&P 500 and a near-30% rally for the PowerShares QQQ ETF (NASDAQ:QQQ) since Christmas. At some point, either the individual stock will pullback for company-specific reasons or Okta will get swept up in a market-wide correction. I’m no doomsday forecaster, but I’m realistic. Stocks don’t go from Point A to Point B in a straight line. At some point, we’ll get a correction in the name. Whether its 15%, 25% or 40% though, I have no idea. On a correction, investors will have to decide if Okta is a name for them. Keep in mind, the company is not yet profitable. Management’s most recent outlook called for a larger-than-expected loss this year, but also better-than-expected revenue growth. At first investors sold the stock on these results, but quickly bid it back up once they realized the growth engine is still churning strong. Estimates call for almost 34% revenue growth this year and for nearly 31% growth next year. The company has $563.7 million in cash and short-term investments, while short-term debt sits at $271.6 million and Okta carries no long-term debt. However, the far more important metric is cash flow. Okta Inc already has positive operating cash flow and is very close to positive free cash flow. If these metrics are able to accelerate and if Okta can turn free cash flow positive, the stock should have even more upside. That said, Okta has one huge knock: The valuation. Shares trade at roughly 20 times this year’s sales. So yeah, waiting for a pullback is certainly prudent. 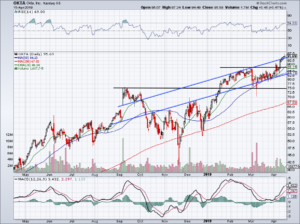 So what might a pullback in Okta look like? 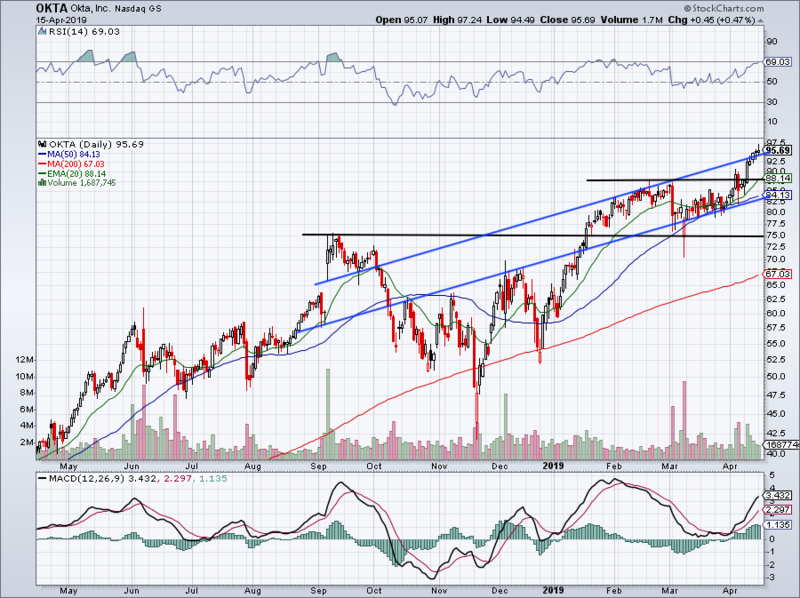 A 10% correction would drop Okta to ~$85.50, right in line with the 50-day moving average and current channel support. However, it’s quite likely that we won’t get a 10% correction fast enough to to where these levels are still relevant. It’s possible, but not something we should bank on. Shares are holding up over channel resistance and if they surge higher from here, this trend could prove to act as support in the near future on a pullback. But I’m not interested in a buying a 4% or 5% pullback after an even higher run. I’m looking to get a good price on this one. I don’t know if we can get a 21% decline from current levels down to $75. But if we do, I would love to consider adding Okta to your portfolio. This would drop Okta down to a critical level and put it just above the 200-day moving average. This level was resistance in September and post-earnings support in March. Aggressive bulls may consider a long position on a correction down to this $85 to $88 level and adding on a dip down to $75. Below the latter level and we’d have to re-evaluate, but as of now these are a few of the levels I’m watching on a correction. Article printed from InvestorPlace Media, https://investorplace.com/2019/04/okta-stock-ready-to-pounce/.